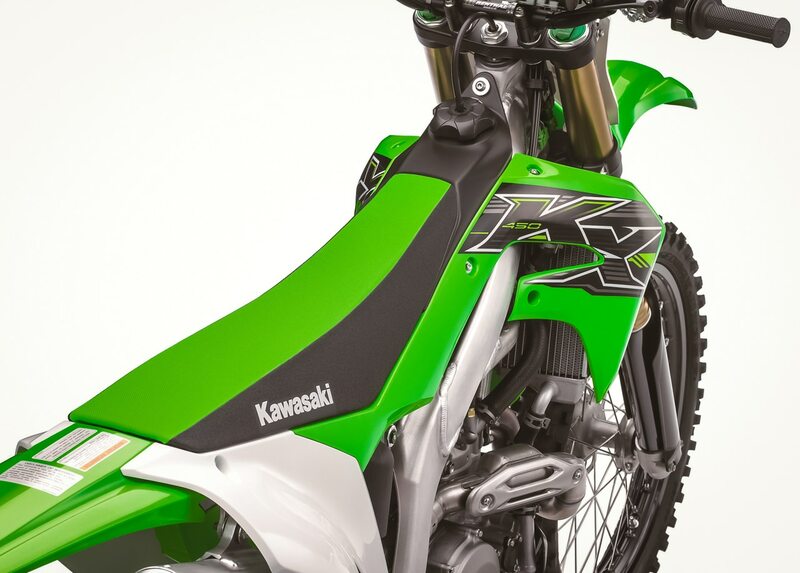 The 2019 Kawasaki KX450F in the flesh. We hope this is the bike we have been waiting for. 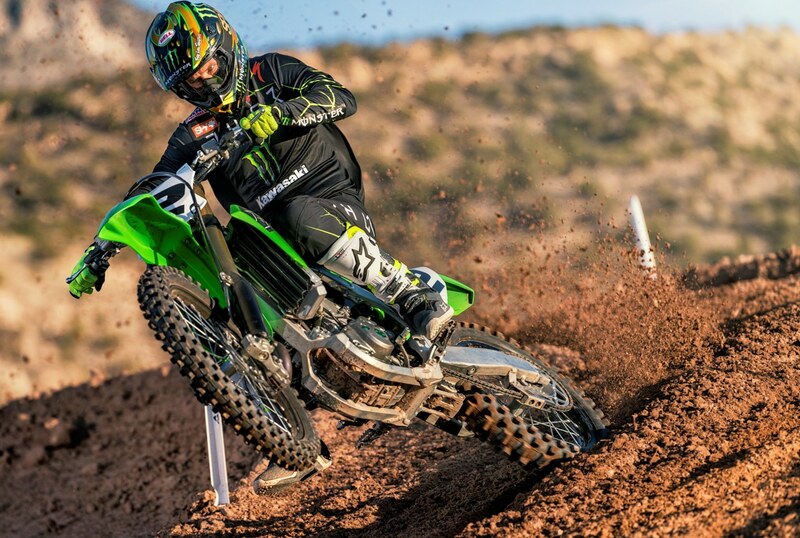 For 2019 Kawasaki has released an all-new KX450F. 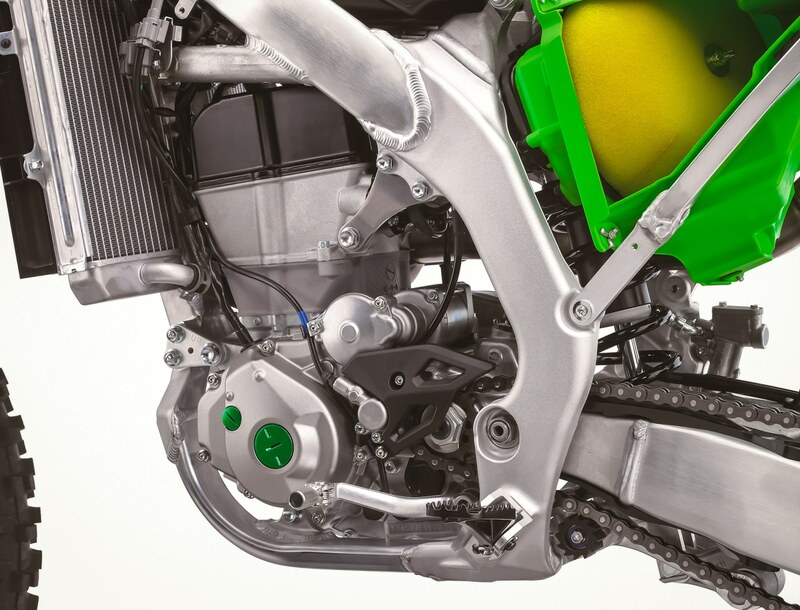 Back in 2015, the KX450F had the best engine in its class. In 2016 it got lighter and more nimble, although the powerband got boring. The 2016-2018 KX450F does everything good, but nothing great. Which is why the 2018 KX450F ranked 5th in MXA‘s 2018 450 shootout. It is hard to beat two Austrian brothers that are lighter, more powerful, have electric start and offers a hydraulic clutch. 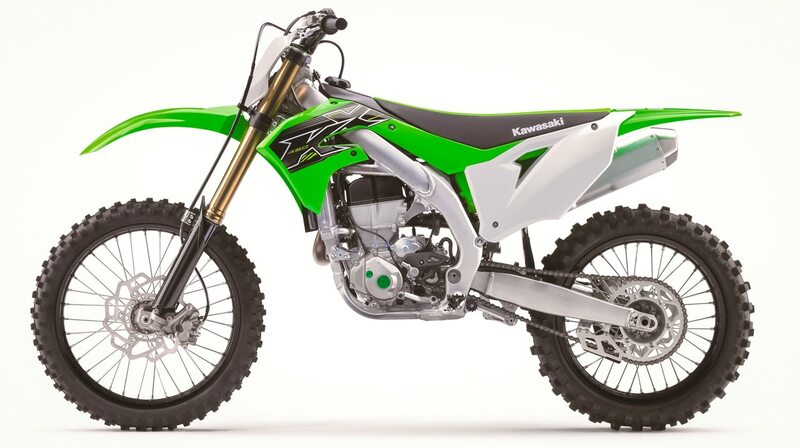 For 2019, Kawasaki has stepped up their game. 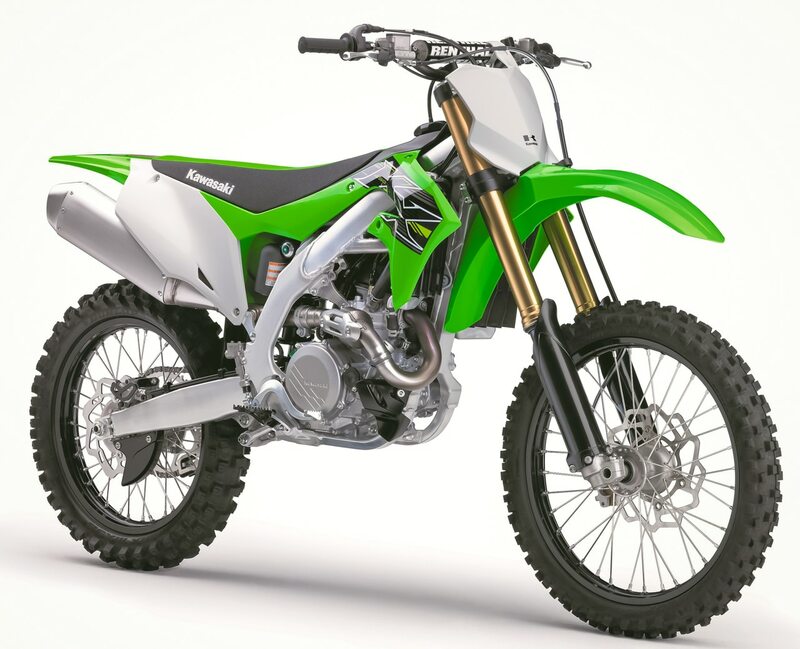 The all-new 2019 KX450F is more powerful, has an electric start and a hydraulic clutch. 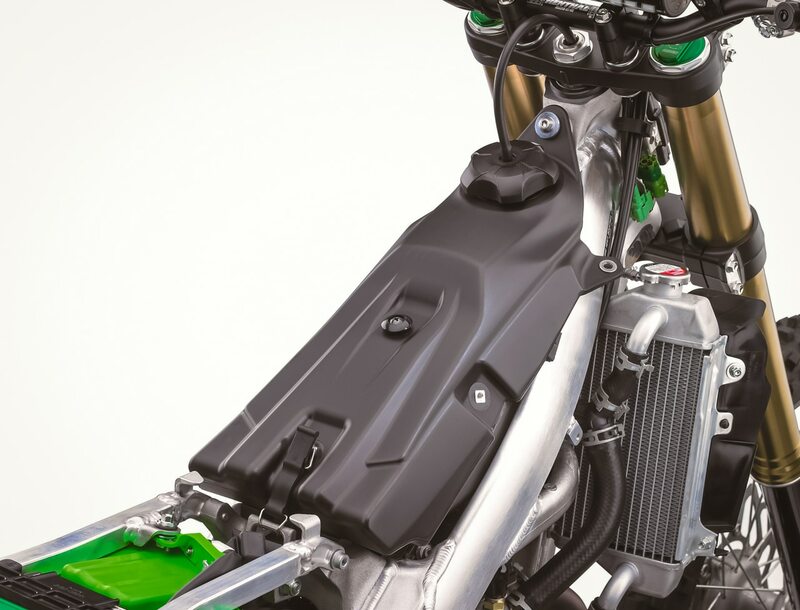 Kawasaki claims thir all-new 2019 KX450F weighs in at 232.4 pounds without fuel. On MXA‘s super accurate scale, the 2018 KX450F weighed in at 231 pounds. 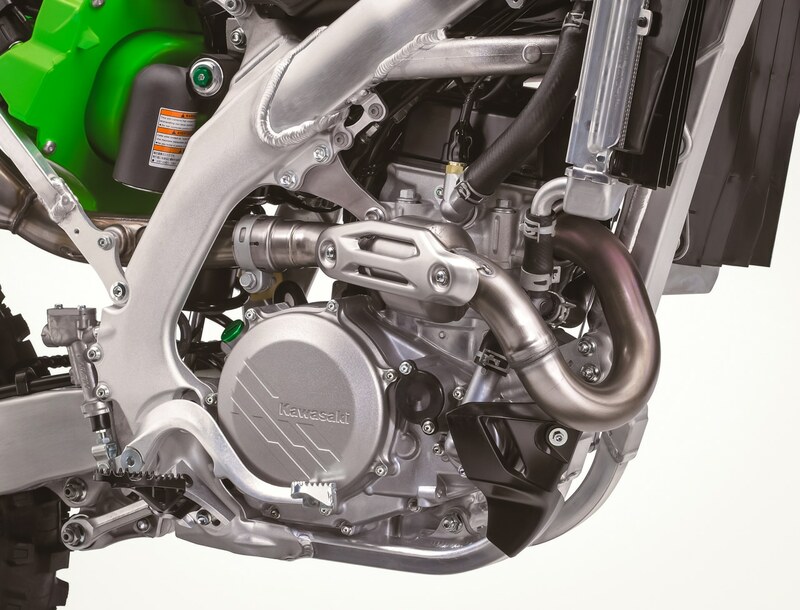 If the Kawasaki scale is correct, the 2019 KX450F would have only gained 1.4 pounds with the addition of a hydraulic clutch and electric starter. Those aren’t KTM or Husky numbers, but it would be lighter than any other Japanese 450 on the market. 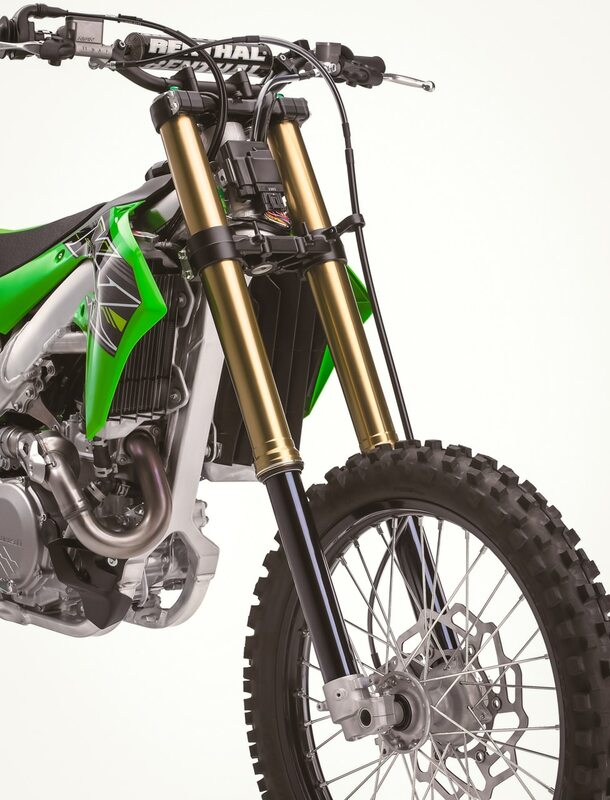 All-new features for the 2019 KX450F include a new lightweight, more powerful engine, new slimmer aluminum frame, new Showa coil spring front forks with A-KIT technology and, of course, the new hydraulic clutch and new electric start system. 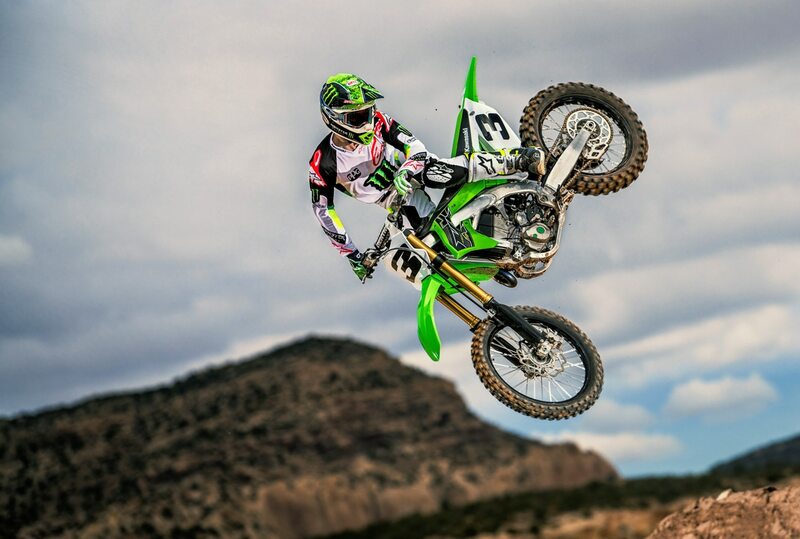 The 2019 Kawasaki KX450F will be Eli Tomac’s weapon for the 2019 season. Front Wheel Travel: 12.0 in. Rear Wheel Travel: 12.1 in. • New piston is nearly 17 grams lighter to help reduce reciprocating weight and contribute to the engine’s increased performance. The piston features a similar bridged-box bottom design featuring fully flush internal bracing as those used on the factory racers, with a short skirt and reinforced external ribs resulting in a lighter, stronger piston. • Aluminum cylinder with chrome composite plating (KP) provides rapid heat transfer, superb wear resistance and optimum lubrication retention for increased performance and durability. • Semi-dry sump (KP) lubrication system for quicker engine response. The majority of oil is stored in the transmission to keep excess oil away from the crankshaft and prevent power-robbing stirring loss. A shallow chamber collects oil at the bottom of the crankcase, where a scavenge pump moves it to the transmission. 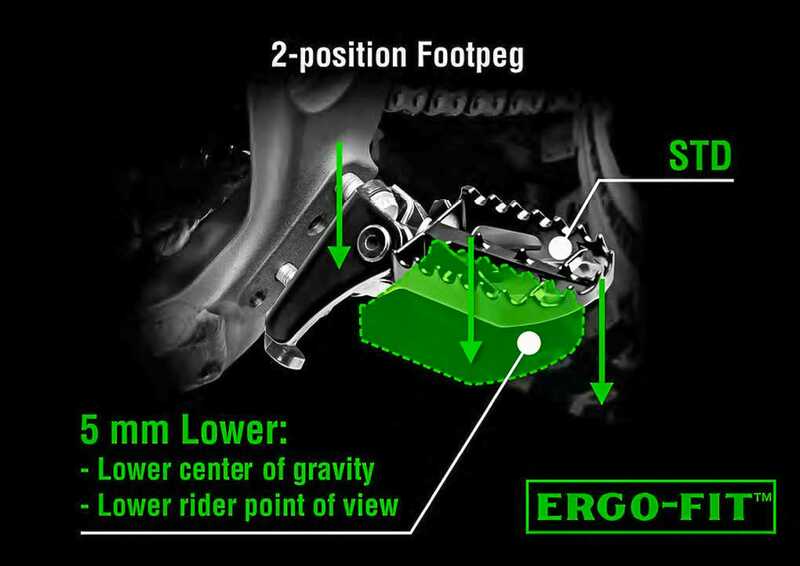 This allows the crank to be located as low as possible to help lower the center of gravity. RACE-TUNED FOUR-VALVE CYLINDER HEAD The finger followers actuate the valves. 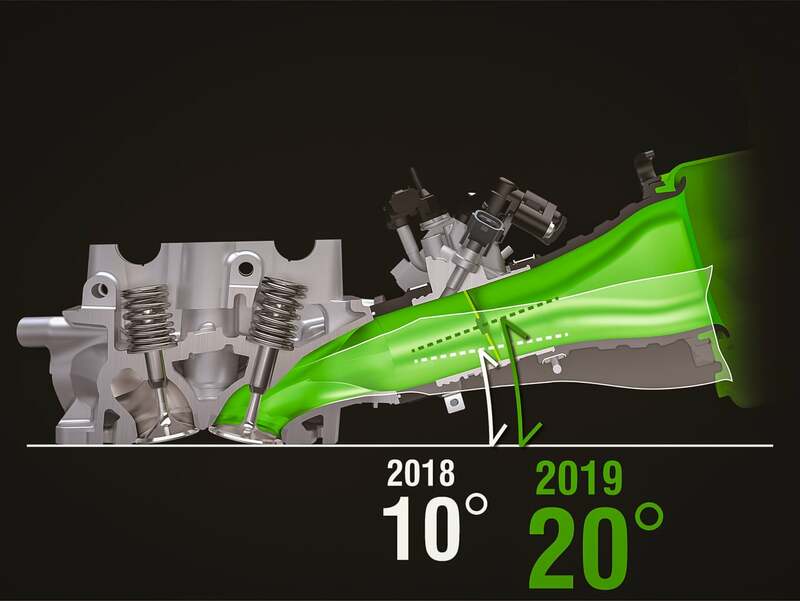 • New finger-follower valve train designed by Kawasaki’s multi-time World Superbike Championship winning engineers allows larger diameter valves, more aggressive cam profiles and higher rev limit for increased high-rpm performance. exhaust valves grew from 31 to 33mm and have 0.5mm more lift. Titanium valves help reduce weight. • When the cylinder head is cast, the intake port cores are coated so that they have extremely smooth surfaces for increased intake efficiency. straighter approach for intake air which improves cylinder filling efficiency to contribute to increased power. atomization from the top-mounted injector. • New fuel pump is more compact and allows a flatter design for the top of the fuel tank. HYDRAULIC CLUTCH This was the closest image that Kawasaki gave us of the hydraulic clutch. Who knows, maybe they are still working out the bugs? There can’t be a lot of bugs since KTMs have had hydraulic clutches for 20 years. 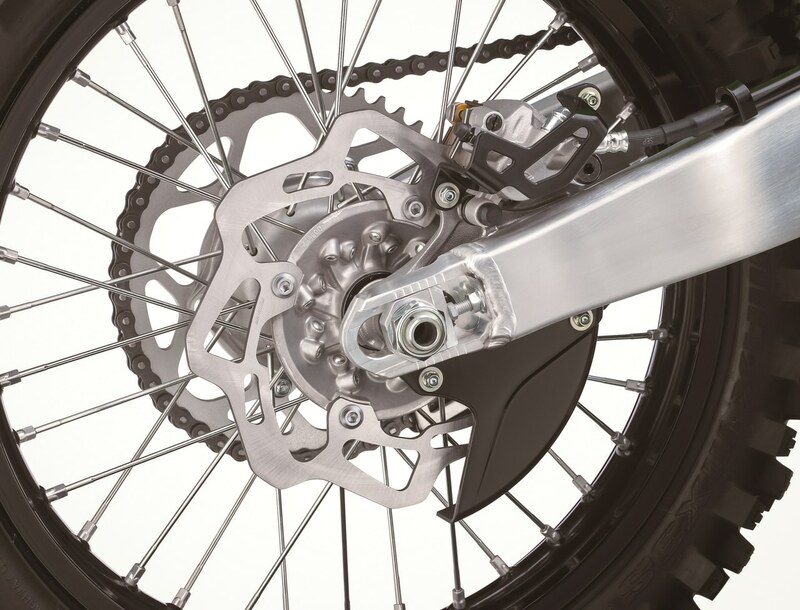 • Hydraulic clutch on a KX motorcycle offers more direct feel and lighter lever action. There is less play as the clutch heats up during heavy use for a more consistent feel. 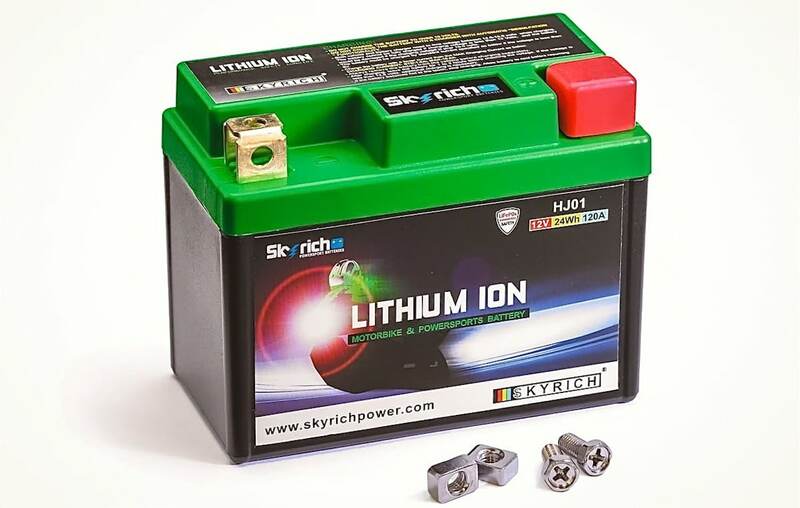 • Electric stater is powered by a lightweight, compact Skyrich lithium ion battery that helps keep weight gain to a minimum. • Automatic centrifugal compression release system on the exhaust cam lifts one exhaust valve to facilitate starting. The system’s simple construction is light weight and highly reliable. Note: Only use Lithium-ion specific battery charger to help prevent fatal battery damage. 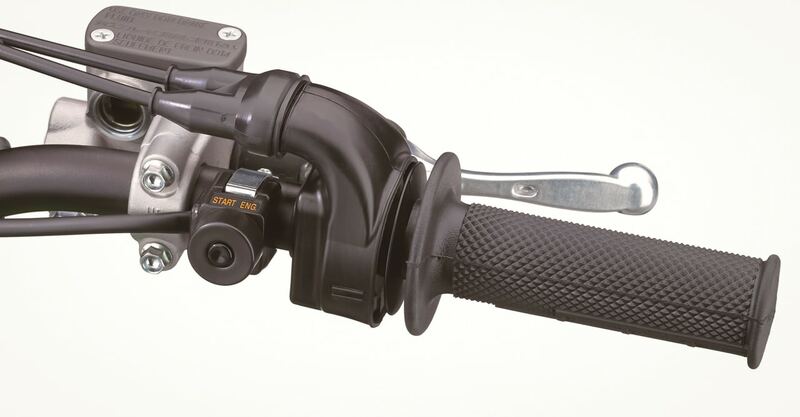 • Riders can change map settings by simply replacing a coupler located on the right side of the steering stem. Riders can choose between Standard, Hard or Soft terrain settings to suit riding conditions. • Can be used on all KX models equipped with DFI. 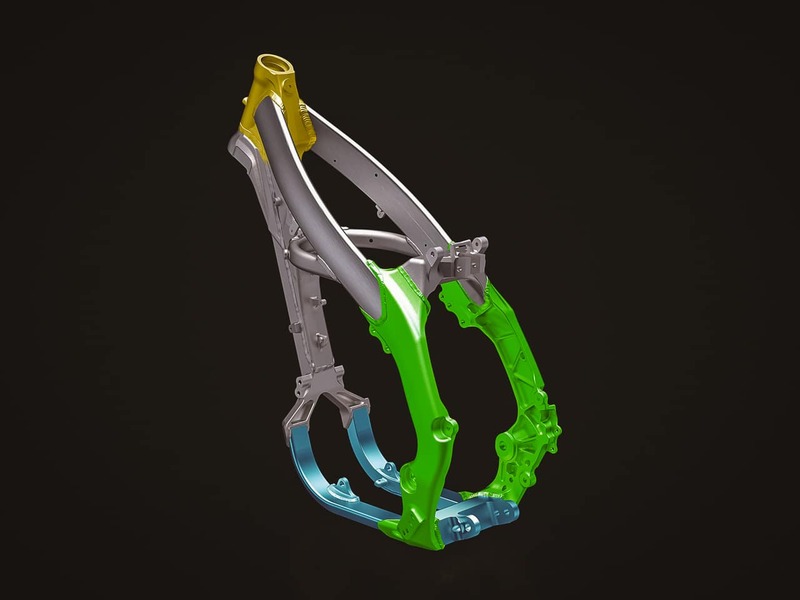 • Similar to the system used on the Monster Energy Kawasaki factory racers, launch control alolws riders to activate a separate engine map designed to assist them get holeshots by pressing a button. situations, and allowing riders to focus on their lines. 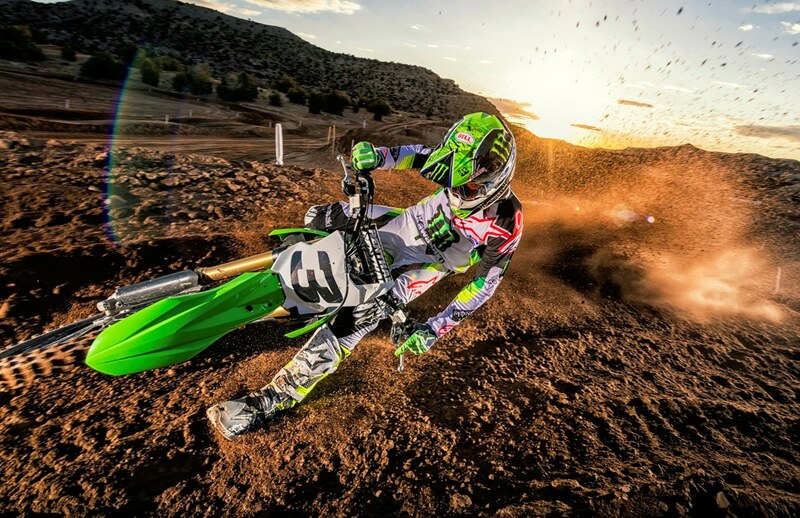 • Even for top-level riders, controlling the massive power of the KX450F off the start requires throttle control and clutch finesse. By slightly reducing this power, Launch Control Mode helps riders maximize traction and increase the chance of getting a good start. • Launch Control Mode has the greatest effect within the first few seconds of releasing the clutch off the start–the most crucial time to get ahead of rivals for better positioning going into the first corner. button flashes quickly to let the rider know the system is engaged. • The new frame offers a better overall rigidity balance. • Revised steering head area with optimized rigidity, main frame rails with revised cross-sections, and a revised line for the swingarm brackets contribute to the overall rigidity balance. Wider lower frame rails also contribute to overall rigidity balance. • Down tube combines a forged front portion with cast aluminum rear piece which contributes to better front end feel. • Design emphasis on providing maximum traction under acceleration. Specific chassis dimensions and design (reinforcing ribs, swingarm pivot output shaft, linkage mounts and rear axle) placed to prevent chassis squat and improve traction. • Equipped with several items developed in Showa’s A-Kit premium aftermarket performance kit fork. • Large-diameter inner tubes –the same size used on Kawasaki’s factory racers –allows large 39mm compression damping pistons and a 25mm cartridge cylinder to be used for smooth action and firm damping. • The inner surface of the outer fork tubes have Showa’s Dimplush texture, which features a wave-like finish to help retain an oil film for smoother action. The Dimplush texture also has Kashima coating to create a hard, low-friction surface that helps prevent wear so the sliding surfaces remain smooth for a long time. The lubricating material in the coating contributes to smoother suspension action, especially at the initial part of the stroke, and a better ride feel. • New low-friction fork oil further reduces friction. • Hard titanium oxide coating on the outer surface of the inner fork tubes helps prevent wear, scratches and other damage to the tubes while reducing stiction and improving overall fork action. 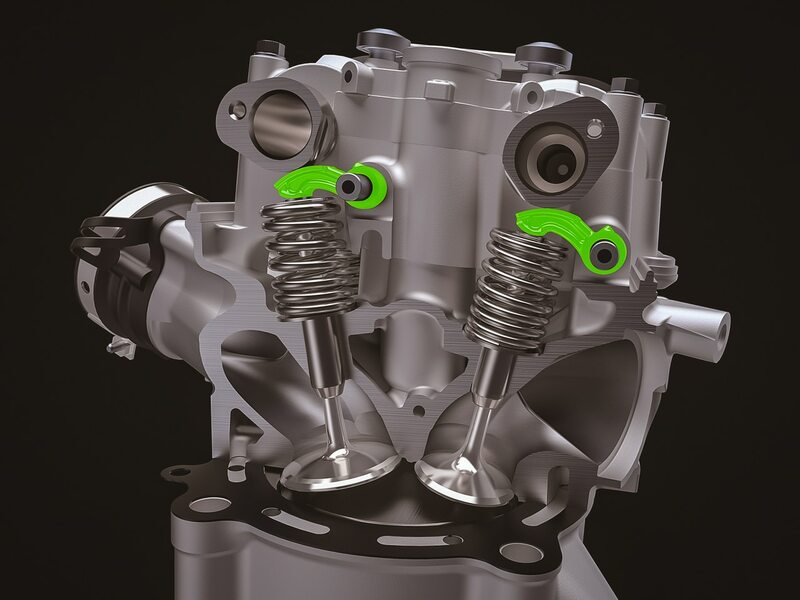 • All new compact designed rear shock has bigger diameter compression adjuster that helps prevent oil cavitation under high frequency movement. 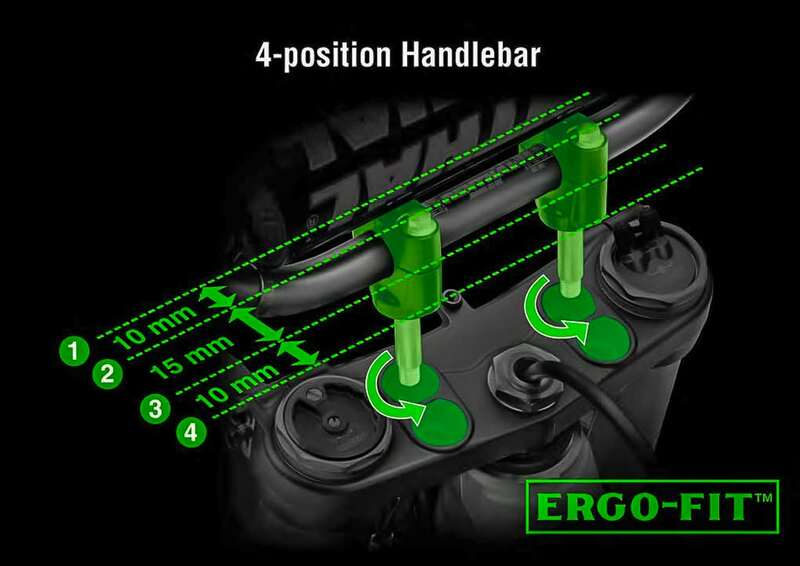 • Uni-Trak rear suspension linkage ratios selected to suit the chassis. The linkage mounts underneath the swingarm allowing additional rear suspension travel yet maintaining a low seat height. The additional rear travel offers improved suspension action over a wider range of track conditions. • Dual compression adjustability allows high-speed and low-speed damping to be tuned separately. 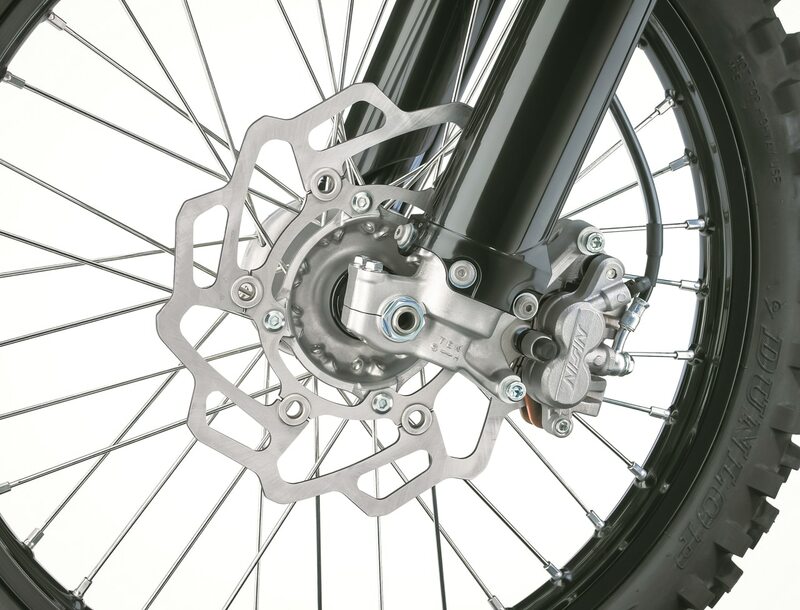 • 270mm Braking brand petal-style front rotor provides superb stopping power. • New Braking rear rotor has been increased from 240 to 250mm for stronger stopping power. • Disc shape helps remove dirt build up in pads, increasing performance. • A smoother, flatter rider interface improves the adjustable racer-friendly ergonomics to help riders improve lap times. • New radiator shrouds are positioned closer to the frame so they are slimmer where the rider’s knees make contact, and the new single piece design make them easier to grip with the legs. Renthal handlebar can be set in one of four positions with a 35mm range of adjustment. 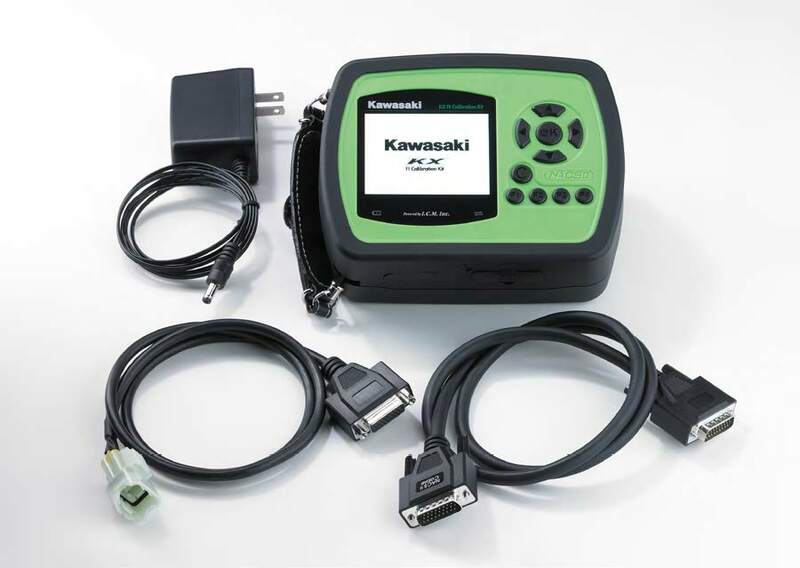 • Optional parts available through Kawasaki dealers include rear sprockets, solid brake discs, handlebar bar mounts for 1-1/8” handlebar, and stiffer or softer shock springs. longevity and an ultra-smooth outer surface.